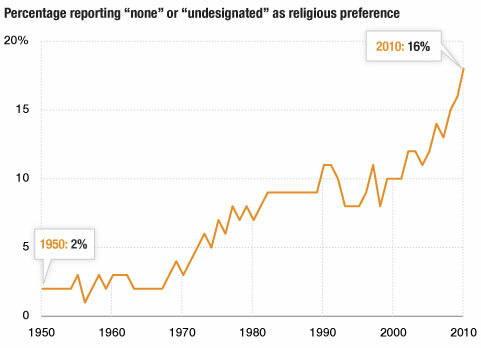 NPR is doing an interesting series on Morning Edition this week on the Rise of the Nones, with the nones being those who answer ‘None of the Above’ when asked what religion they follow. The trends clear that this segment is growing. I think the single most important reason for the rise of the unknowns is that combination of the younger people moving to the left on social issues and the most visible religious leaders moving to the right on that same issue. That is my experience as well. In the sixties the churches were at the forefront of many of the social changes, including civil rights and, to a lesser extent, the war in Vietnam. The rise of mega-churches over the past two decades, with an increase in fundamentalism, has driven many away and created a huge rift between the religious and non-religious. 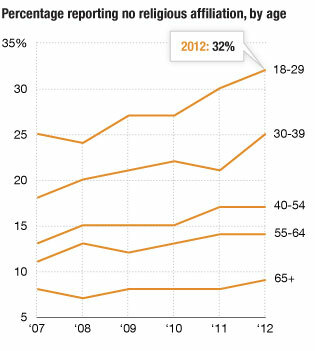 The graph of the nones by age confirms that there are large generational differences in the US that are increasing. Given trends in Europe during the last 40 years, I don’t see the tide the changing in the United States. Hi this is a little off topic as I could not find any contact information but I am starting a group for athiest/agnostics/skeptics interested in giving back to the community of Pittsburgh. Right now I am in the starting phase and searching for people that are interested. We are having our first meeting on Saturday! A.long with a want to volunteer an important part of this club is that we beleive that America should be secular in every aspect and support that mindset. If anyone is reading this my contact is godlessintheburgh@gmail.com and I would love to hear from people that are interested!